One thing that I must comment upon with a traditional writing conference like SiWC (this is their 21st year) is the frustration of concurrent sessions. I don’t think there was a time where I didn’t want to attend at least two of the sessions. This is SO a first world problem, as Chuck Wendig would say. So I got over my bad self and made some decisions. 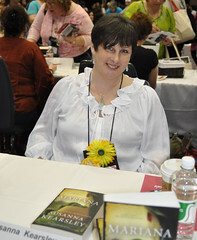 My first one was to attend Susanna Kearsley’s session on writing supernatural aspects of stories convincingly. Though my stories are all either straight out fantasy or science fiction, it’s always good to have a few more tools in the toolbox. I’ve been a fan of Susanna since I took a workshop with her in Port Elgin in 1994 (possibly 1995?). She’d just won the Catherine Cookson Award for her novel Mariana. It starts with character. You must have a likeable, trustworthy, relatable protagonist. The protagonist can be the character who possesses supernatural skill, or they could be the biggest skeptic in the book. Work on the principle of Ockham’s Razor first. Stated succinctly, the simplest explanation is often the most correct. People tend to rationalize the unknown. Transition to deductive reasoning. Think Sherlock Holmes: after every other possibility has been eliminated, what is left, no matter how unlikely, is the truth. Respect both sides of the argument – believers and skeptics. Time travel – paradox. If you travel into the past and accidentally kill your grandfather, do you cease to exist? Research. All psychology departments usually have parapsychology sub-departments. Your protagonist’s acceptance of the supernatural should be a gradual process. Also, you need someone who is an even bigger skeptic than the protagonist. As the protagonist proves to her or himself and the other skeptic that the supernatural is the only ‘rational’ explanation, he or she is also proving it to the reader. In the handout – two accounts of a UFO sighting. One from an air force pilot who went through the deductive reasoning process and eliminated all other reasonable alternatives until he was left with a UFO, the other from a man on LSD. Which would you believe? Make your protagonist reliable, unless that’s part of her or his journey, to prove what they saw despite obvious reasons not to. Canadian psychic – George McMullen. Psychometry. Keep your world real, working by the rules you have established. Naomi Novik made dragons believable. Be aware of our current level of understanding of the supernatural aspect you use in your novel. Choose one thing. Too much will overwhelm. Stephen King uses wounded heroes. They are more sympathetic. No coincidence, contrivance, or anything too convenient. We have been raised on nursery rhymes, fairy tales, myths, and legends – we are taught to accept the existence of magic. Where/when we expect to find magic: isolated places and buildings, the woods, old houses, night time, fog or mist, the sea, transitional places like the shore, twilight, dawn, the witching hour. Play with expectations, or play against them. Against may be the more powerful technique, but it’s also the more difficult to pull off. Be aware of cultural biases. Voice is important. Communication is the goal of writing. Aim for the grade eight level reader to reach the widest audience. Genres: magic realism, modern gothic, paranormal, paranormal romance, historical. Donald Maass has predicted that eventually, genre will be irrelevant. It’s a marketing construct. You can cross genres, but do not transcend them! In historical fiction, there will be other explanations for things than there will be in a contemporary novel. The outsider is a powerful thing. Use this character to explain, gain perspective, but resist the urge to over-explain. Also check out the Koestler institute of parapsychology. GoogleBooks is a great resource for historical records. Jstore is where you can obtain information from academic journals online. What great notes! I was there but you definitely wrote down more than I did. And I’m glad you made the choice you did; Susanna’s talk was definitely worth attending. Did you happen to notice she was wearing the necklace with the stone with a hole in it? Thanks for stopping by and commenting, Susan, and for the follow. I do my best, but I think I still end up hearing mostly what I want to 😉 I did notice the necklace. I think she pointed it out.